In Sub-Zero Temperatures, Skiers Find 'Bliss' In The Frozen Woods It sounds miserable to spend a day with ice plastered to your face. 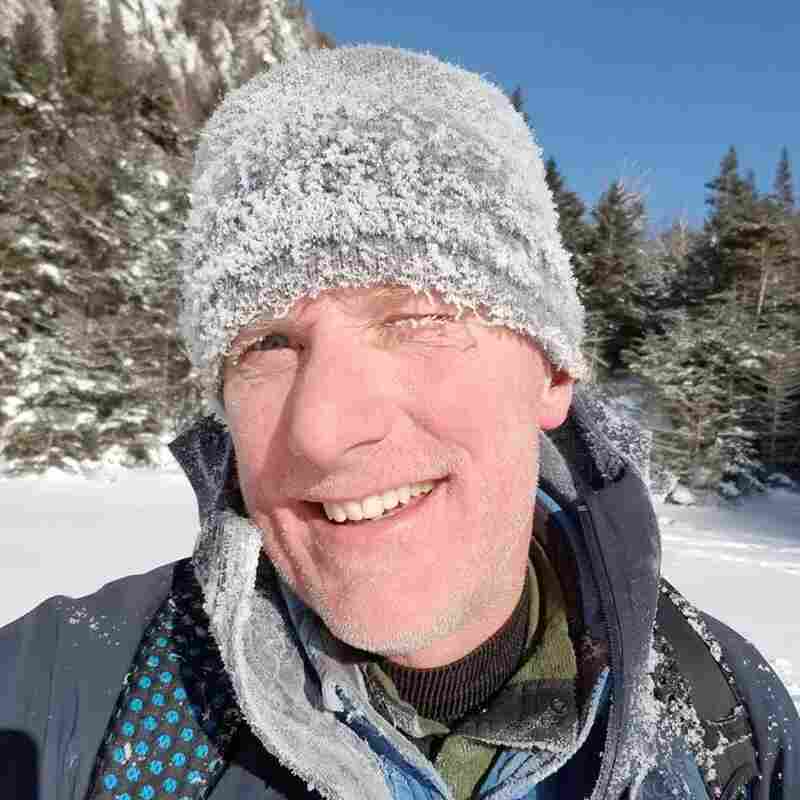 But reporter Brian Mann loves the beauty, community and fun that come with venturing out in harsh conditions. Snow dunes and an icy sun at Marcy Dam in the High Peaks of New York's Adirondack Mountains. Setting off through the winter woods, I am wrapped like a Christmas package with seven layers of insulation between myself and the day. I'm wearing mittens an astronaut on the surface of the moon would envy. This is one of those ice-box cold, double-digit below zero days and the snow has that super cold squeak. The air is just absolutely metal cold, but the cool part is that it is radiantly sunny outside and windless, so there's a blue sky and sun just cutting through these trees. In this first week of the New Year, hard winter is gripping much of the U.S., setting records for frigid cold, triggering wind chill advisories. 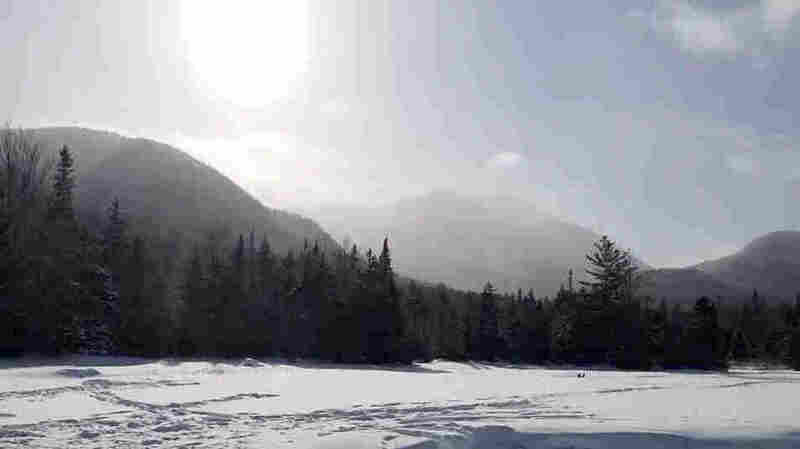 In New York's Adirondack Mountains, the temperature has dipped to minus-30 degrees Fahrenheit. That can be dangerous, and most people find every reason to stay inside and warm. To them, it sounds miserable to spend a day with ice plastered on their faces. But some of us find beauty, community and fun in venturing out in these harsh conditions. On this recent day I'm out wilderness skiing and, amazingly, the winter woods aren't entirely still. Crossing a bridge over a mountain river, I can hear the stream rumble, down below blankets of snow and ice. And I'm not alone out here. 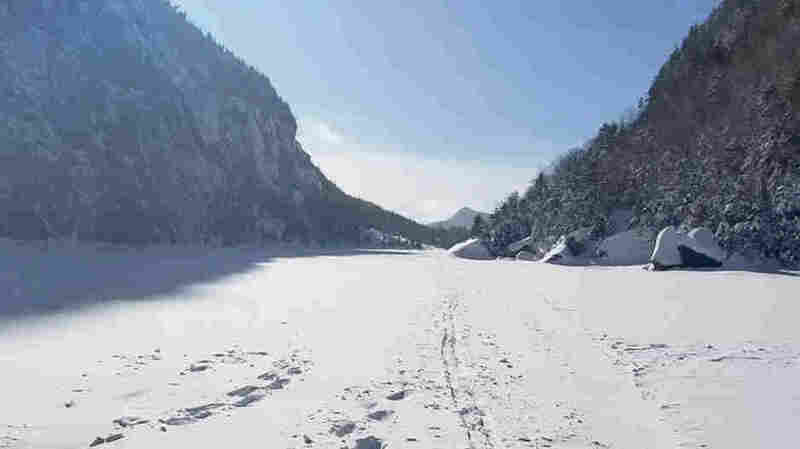 While skiing across a frozen lake, I hear other voices. Campbell and Michelle Houston, from Fairfield, Conn., ski into the clearing, both grinning big. "We're just happy out here and we like being away from the crowds," Michelle Houston says. "If it's colder, it's harder, it's more brutal, we want to do it." If it's colder, it's harder, it's more brutal, we want to do it. "It's just what we do," Campbell agrees. "We like being out here. We like challenging ourselves a little bit and it's beautiful on these cold days." Here's a thing I love. On days like this in the backcountry, there's a lot of solitude, but there's also a kind of community. "I also have homemade chia coconut energy bars, you have to try it," says Helena Grant. She's also visiting from Connecticut and this is her first time skiing a wilderness trail. I ask her if she was daunted to try it with the thermometer stuck at double-digits below zero. But she says she was eager to get outside. "Oh, I said, 'Hell yes' ... Actually this is something I've been hoping to do," Grant says. "My grandfather was in the 10th Mountain Division. He used to climb up Marcy for breakfast. I feel like I'm in my element, I just never had gotten here before." 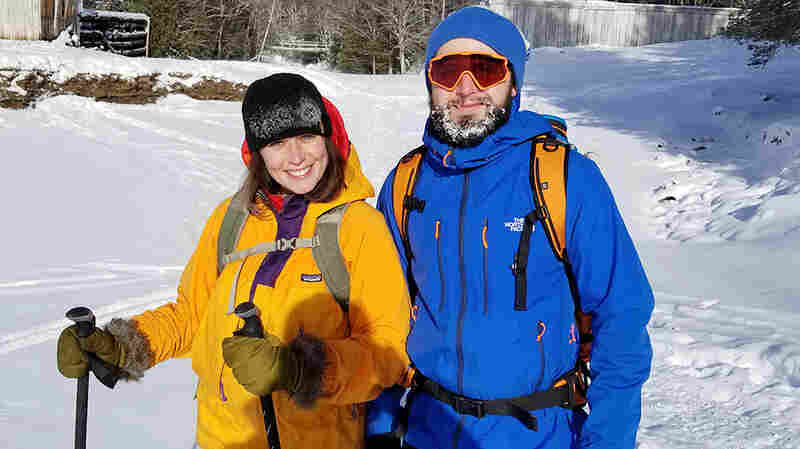 Her ski partner is Brantley Beach from Keene, N.Y. He's also grinning through a thick crust of ice in his beard. "It's actually warmer once it all kind of freezes over. There's this layer of warm air between the ice and my face," he says. So I ask Grant to try to explain why this kind of outing appeals. Helena Grant from Connecticut skiing with Brantley Beach of Keene, N.Y. "This is bliss," Grant said. "You're beyond all the cares of the world. And it almost brings tears to the eyes." "This is bliss, you're beyond all the cares of the world. And it almost brings tears to the eyes. And the sun — I mean you don't feel like you're in, what is it, I don't even know what the temperature is. Negative 12?" "Probably around negative 15 or 20 up in here," Brantley says. "It doesn't feel like [it]," Grant says. "There's no wind. There are little flecks of snow coming off the trees. I can't even describe it it's so beautiful." We go our separate ways and soon I'm back in solitude, skiing high in a mountain pass. It's just a narrow fairy tale forest, thick with snow, the trees heavily laden. Ski tracks and boot prints across Avalanche Lake. Then the birch and hemlock give way, opening to one of the most dramatic views in the eastern U.S.: Avalanche Lake, its surface frozen white, towering mountain walls on both sides. The cliffs on both sides are locked in ice, with big long sheets of ice across the brown and black rock. The sun is just perched on the edge of the rock. I'm in a bath of sun but just a few feet to my left there's cold shadow. I feel like I've found the heart of winter right here.